Frank Oz's 2007 black comedy Death At A Funeral is given the remake treatment with an urban spin in this Chris Rock-produced production. When a dysfunctional clan reuintes to mourn the passing of the family patriarch, a respectful funeral quickly turns into an all-out fiasco marked by bitter resentment, blackmail attempts, and scandalous revelations. Dean Craig penned the script for director Neil LaBute, with Martin Lawrence, Tracy Morgan, and Danny Glover co-starring. $16.217 million on 2459 screens. Although he built his career around dark comedies such as In the Company of Men and Nurse Betty, director Neil LaBute goes for broader farce via 2010’s ensemble flick Death at a Funeral. When Edward Barnes (Bob Minor) dies, many generations of family and friends gather to mourn him. The funeral takes place at Edward’s, and his son Aaron (Chris Rock) gets the job to organize much of the ritual. That’s just one of the pressures on him, though. His mother Cynthia (Loretta Devine) and his wife Michelle (Regina Hall) pressure him to have kids, and he competes with his brother Ryan (Martin Lawrence). Aaron wants to be a novelist, but Ryan enjoys a successful career in that field. Known as the writer in the family, everyone wants Ryan to say the eulogy, but as the oldest, Aaron insists that he perform that task, even though this adds to his stress. Other family issues emerge. Aaron’s cousin Elaine (Zoë Saldaña) plans to marry her boyfriend Oscar (James Marsden), and that makes him tense, as he believes her father Duncan (Ron Glass) disapproves of him. To ease the pressure, Elaine gives Oscar a Valium she finds at her brother Jeff’s (Columbus Short) apartment. However, it turns out that the pill contained a hallucinogenic, and this prompts Oscar to act in a nutty manner. A few additional threads emerge. Family friend Norman (Tracy Morgan) gets stuck watching Aaron’s cranky old Uncle Russell (Danny Glover), and Norman’s pal Derek (Luke Wilson) tries to supersede Oscar and reignite his old romance with Elaine. Finally, an acquaintance of Edward’s named Frank (Peter Dinklage) tries to use his relationship to bilk some money out of the family. When I went into Funeral, I thought it reeked of remake. I was correct, but for the wrong reason. The title smelled like something that’d redo a French farce, but instead, it remade a Frank Oz flick from 2007. That version was a British production, though the presence of Oz implied a US flair as well. I guess the owners of the rights figured that the tale needed Americanization, and the fact it revolves around an African-American family gives it a certain twist as well – not that race plays much of a role in the film. In fact, skin color only crops up once, and even then, we hear about it just to facilitate a quick joke. I think that was a mistake, as a) the gag isn’t that good, and b) the comment about race briefly takes us out of the film. Up until that point, the movie remains resolutely colorblind, so the joke disrupts that tone. It’s not a fatal flaw, but it seems like a bad choice, as the quick racial remark simply doesn’t fit with the rest of the flick. I’ll have to see the 2007 original to determine if it used a similar gag with its white cast. I get the impression that the remake offers a fairly literal copy of its predecessor; writer Dean Craig adapted his own screenplay for the 2010 edition, and Dinklage plays the same role in both. I would definitely be curious to determine if Oz managed to elicit more laughs from the material than LaBute does. In the latter’s hands, Funeral provides decent amusement, but I can’t say that it’s a consistent winner, especially because it limps as it gets toward the finish line. What changes? As it progresses, Funeral pushes harder for broad comedy. Most of the film’s real farce occurs during the last act; we find fights, poop jokes and general mayhem. Maybe some folks will like these moments best of all, but I think the film is funniest when it keeps things small. It does include a good array of jokes, and these fly when the movie doesn’t over-exert itself in an attempt to entertain. More outrageous usually isn’t better, though given the popularity of the wildly over the top Hangover, my belief may not gel with the majority. Despite its flaws, I do think Funeral is funnier than Hangover, but that may say more about my general disappointment with the latter. 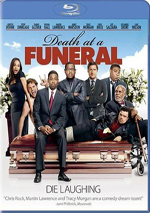 Funeral does provide a reasonable number of laughs, and it comes with a pretty solid cast, though I’m not quite sure how many of them can act. Rock, Lawrence and Morgan are comedic actors with an emphasis on “comedic”; they can be very funny, but I can’t claim any of them possess much dramatic ability. When they’re required to dispense jokes, they do fine, but when the movie asks for more than that, they falter. Of the whole cast, Dinklage stands out as the most entertaining. I wish he’d get more roles that had nothing to do with his stature, as it’s abundantly clear the man can act. He gives Frank a personality just flamboyant enough to amuse but doesn’t resort to any overtly stereotypical flourishes, and he makes the most of his time on screen. If the main actors could combine comedy and realism as well, Funeral probably would’ve been more consistently satisfying. As it stands, the movie certainly boasts decent entertainment value, but it lacks a thorough level of amusement. Still, it’s funny enough to merit a look. 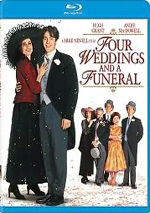 Death at a Funeral appears in an aspect ratio of approximately 2.40:1 on this Blu-ray Disc. I felt totally pleased with this terrific transfer. Colors were fine. The movie went with a fairly natural palette that favored a mild amber tint. The hues looked full and rich. Blacks were dark and tight, while shadows demonstrated good clarity. I thought the image looked absolutely smashing. One shouldn’t expect sonic fireworks from a comedy such as Funeral, and the DTS-HD MA 5.1 soundtrack remained subdued. The mix featured good stereo music and decent environmental information but little more substantial than that. The surrounds played a minor role at best, so don’t expect much from them; even the most farcical scenes didn’t boast much activity. As we head to the extras, we open with an audio commentary from director Neil LaBute and actor/producer Chris Rock. Both sit together for this running, screen-specific look at the opening credits and the film's use of music, sets and locations, cast and performances, adapting the original film, cinematography, editing, costumes, and a few other production areas. Overall, the commentary gives us a good look at the production, but man, does it come with a lot of happy talk! LaBute is the main culprit, but Rock throws in a lot of praise for all involved with the flick as well. They lay it on pretty thick at times. Nonetheless, the content helps make the track mostly enjoyable. Though I'd like more info about the adaptation of the original movie - they allude to a lot of rewrites but offer few details - we do learn a reasonable amount of information here. Rock throws out occasional witty remarks as well, and the two mesh well in this generally likable piece. One odd observation: both LaBute and Rock appear to believe that Funeral got an "R" rating solely due to the use of drugs. Nope - that may well be an MPAA no-no as well, but I suspect the 8000 or so "F-words" was the main cause of the rating. LaBute and Rock mention the profanity as well, but they seem convinced that without the drugs, they could've gotten away with all those swear words. Seven Deleted Scenes fill a total of seven minutes, five seconds. These include “’Who The Hell Is This Guy?’” (1:35), “Cynthia Walks In On Aaron and Michelle” (0:40), “’Are You Family?’” (0:39), “Oscar in the Bathroom” (1:13), “Duncan Gives Derek a Pep Talk” (0:44), “Marco Polo” (0:30) and “Michelle and Elaine Talk in Front of the Bathroom” (1:44). Some of these offer short extensions of existing scenes; that’s especially true for “Guy”, which only presents about 20 seconds of new content. Others add a little character/story exposition. None seem especially memorable, though “Polo” offers some childish amusement. A Gag Reel runs two minutes, 37 seconds. It provides a short reel with the standard mistakes and cackling. It’s pretty typical fare, though it’s funny to see Tracy Jordan wrestle with a Bluetooth. Three featurettes follow. Death at a Funeral: Last Rites, Dark Secrets goes for 20 minutes, 11 seconds and provides remarks from LaBute, Rock, producer Ayesha Carr, DP Rogier Stoffers, executive producer Glenn S. Gainor, production designer Jon Gary Steele, and actors James Marsden, Columbus Short, Regina Hall, Danny Glover, Zoe Saldana, Luke Wilson, Ron Glass, Tracy Jordan, Martin Lawrence, Loretta Devine, and Peter Dinklage. “Rites” discusses the adaptation of the original flick and various story elements, cast, characters and performances, LaBute’s approach to the material, shooting on video instead of film, sets and locations. “Rites” throws in some decent behind the scenes shots, but it includes very little content that can’t already be found in the commentary. In addition, it suffers from a fluffy tone that makes it awfully insubstantial. Chalk this up as little more than a standard promotional piece. 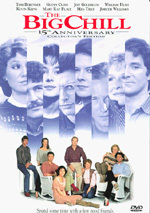 Family Album lasts 10 minutes, 59 seconds and features Devine, Glover, Lawrence, Rock, Hall, Jordan, Wilson, Glass, Short, Saldana, Marsden, and Dinklage. The actors simply discuss their characters. There’s no insight here; they just give us basic notes about their roles. That makes it a waste of time for anyone who’s seen the movie. Finally, the five-minute, 55-second Death For Real offers info from Rock, Morgan, Short, Hall, Carr, Dinklage, Devine, Wilson, LaBute, and Glover. The participants muse about death and funerals. A few amusing moments emerge, but the show remains forgettable. A few ads open the disc. We get clips for The Karate Kid (2010), Grown Ups, The Back-Up Plan and Stomp the Yard: Homecoming. Those also appear under Previews along with promos for Bad Boys and The Other Guys. No trailer for Funeral appears here. A second disc provides a Digital Copy of Funeral. This lets you slap the flick on a computer or portable device. Go for it? A remake of a recent British film, Death at a Funeral makes me curious to see the original. While I think the 2010 edition has value, it’s inconsistent enough that I’d like to find out if the prior version suffers from the same flaws or if it works better as a whole. Whatever the case, the remake boasts fair entertainment and keeps us with it. The Blu-ray demonstrates excellent picture quality, restrained but appropriate audio, and average supplements. Funeral never excels, but provides a moderate number of laughs.